Welcome to Altenew Stencil/ Ink Spray Release. My card today features the Feathered Leaves Stencil. I started by tracing the stencil image onto Crest Solar White Cardstock with a permanent black pen through the Feathered Leaves Stencil. Next, I coloured in the spaces with Artist Markers. To achieve the perfect Christmasy red, I used Grapevine, Velvet, Ruby Red, and Crimson Artist Markers. For the Christmas element, I thought I'd use the Layered Snowflake Dies. I die cut all the layers out of a mix of vellum and white cardstock. I adhered them with foam tape on top of each other. To finish, I adhered a few clear, sparkling crystals onto the topmost snowflake layer. The sentiment is from the Festive Poinsettia Stamp Set. I accented the sentiment strip with Silver Glitter Tape. 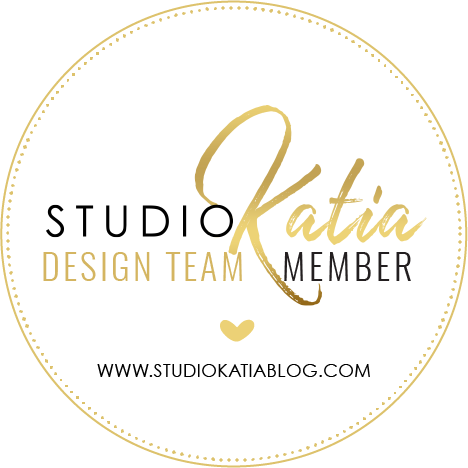 Scrapbook Blog by 12/3/2018 for a chance to win. 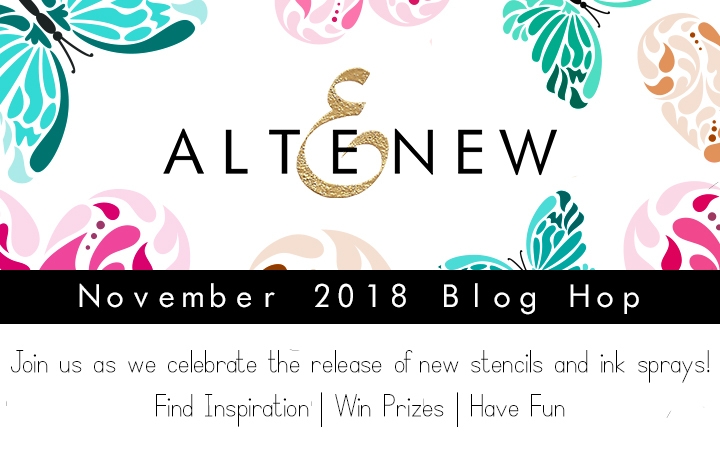 6 winners will be announced on the Altenew blogs on 12/7/2018. Leave a comment on this post, I will pick and announce the winner on 12/3 for a $30 gift certificate. The next stop on the hop is Rowena! Wow! What a GORGEOUS card. This looks like a brilliant pile of Christmas ribbon. Genius! Ya know when you see a card and it makes you say, "I must try that!"? This is that card. Gorgeous card - a really unique idea for a Christmas card! Love these stencils! Thanks for sharing this gorgeous card. Beautiful card 😍 I know that was time consuming. Beautiful card! Love all the new products! Very bold and beautiful card. Love the way you have used the stencil. The new release is awesome. Gorgeous. Thank you for the inspiration. What a great idea using the colors, stencils and the snowflake. Modern and fun. What an eye catcher this card is! I love it! Thanks for the tip in combining the three reds to get the rich “Christmas” red perfect! My favorite card in the whole release. Thanks for the chance. wow your background is stunning - love the bold color!!!! This feels so crisp and fresh! I was really drawn to it!! So gorgeous!! Such a unique and creative idea. Thanks for the inspiration. Wonderful card! Great technique with the new stencil and love all the bright colors. Your card is absolutely gorgeous. You’ve used the stencil in a way I haven’t seen before. Thank you so much for your inspiration. Your work is always amazing. Thank you. I can't believe you traced all those lines! But it came out so beautiful and such a rich color. wow. That really took some thought and work! Nicely done. Love the black highlights..!! Very stunning! Love that deep, rich red color, and the lovely layered snowflakes! OK, that is a gorgeous card!! Your detail coloring really shines and pops. Very pretty! I love the die and your background looks great! Your card is stunning! I love the colors you used. The snowflakes stacked is gorgeous! Thanks for sharing. what a beauty! love the way you traced around the stencil and then colored it. the snowflake is gorgeous. Wow. What a beautiful Christmas card. Zowie! Eye-catching, indeed. I have never, ever thought to use a stencil and draw lines around all the lines and THEN color it. I'm thrilled to learn this technique. LOVE the Christmas reds on the Feathered Leaves, GORGEOUS background for these pretty snowflakes. Love this card. I hadn’t ever thought to use markers with a stencil! Such a beautiful card! The red and white look like Christmas. The Feathered Leaf stencil is a great addition to the Altenew family. SO UNIQUE! I love the the stunning colors!!!! What a brilliant,brilliant card Erum ! !I love the way you have used the stencil in such a unique way to do that amazing coloring ! I would have never thought to use the feathered leaves stencil in a Christmas design but it looks fabulous. The snowflake just pops off that background. Stunning card. Thanks for the inspiration. Wow! Amazing background! love the new stencils!! The red background makes a lovely holiday card. I like the vibrant background for the pretty layered snowflake. Your card is stunning! I love how you colored in the Feathered Leaves Stencil. 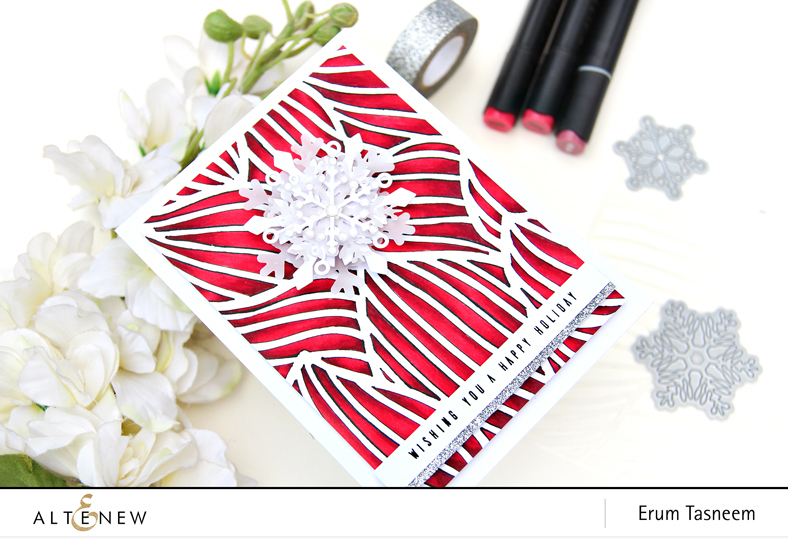 This stencil shines and your card is perfection! A great idea for that stencil. WOW!!! Love the technique. Love the RED background with the layered snowflakes. Well done! Fantastic and eye-catching card! Love this stencil technique as it's different from what you would normally think of! TFS! This is breathtaking! The colors and shading and sparkle work so well together. WOW! 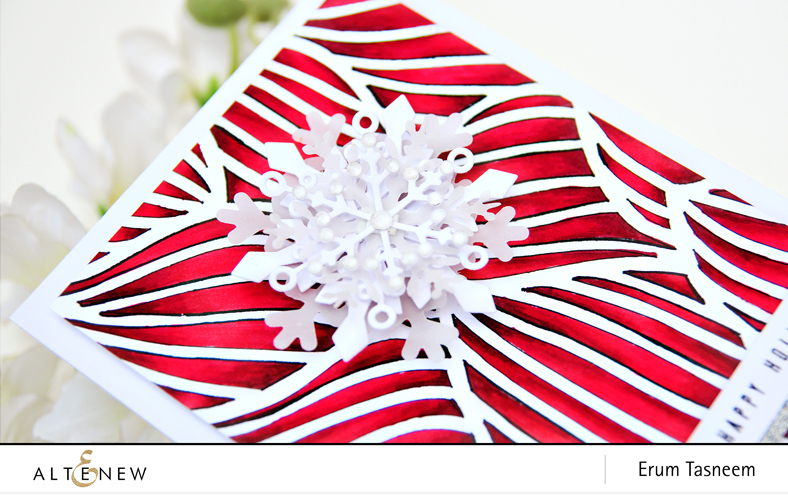 The Feathered Leaf stencil really gives movement to the snowflake and the red color makes a beautiful total package. Beautifuly executed, beautiful card! Love your new style in this card the red background is just perect in this card. What a beautiful card!!! I wouldn't have thought to use the stencil for Christmas! Thank you for sharing!!! Love your Christmas card! Fabulous. Beautiful! Love that you made a holiday card. Such a gorgeous card! Never thought about using a stencil that way. 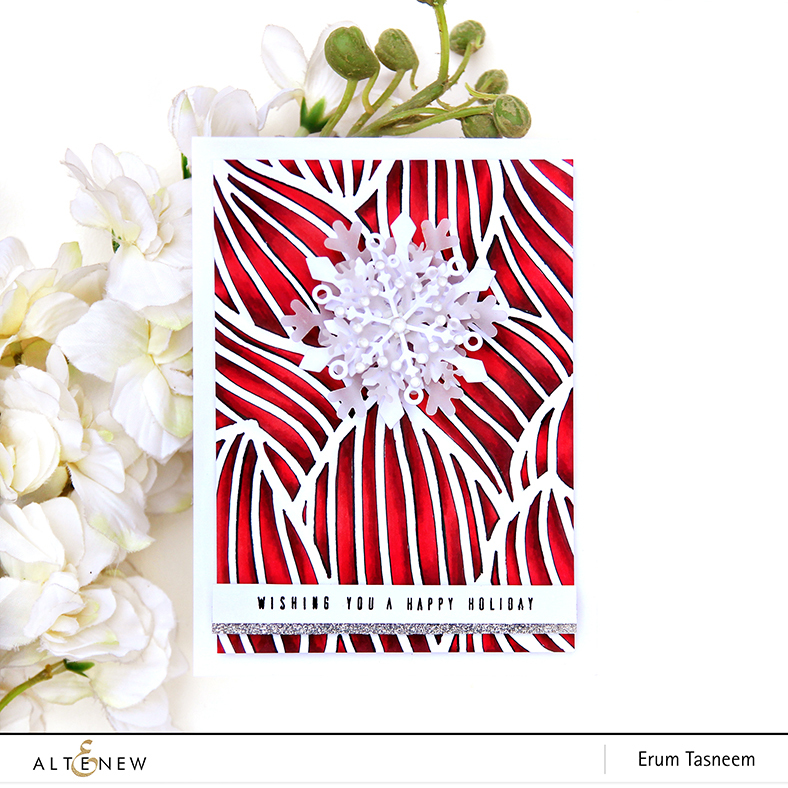 Wonderful design..
Wow - great use of that feathered leaves stencil - that is a gorgeous saturated background, and looks great as a Christmas/snowflake card! Great card showing the versatility of stencils. Super cute. Wow! Love the bold effect you acheived by tracing inside the stencil with a black pen, then coloring. Love this look. Very cool. I love it! The red you created is incredible. It is just awesome!! The card is very festive and Christmasy. Beautiful!! Beautiful use of coloring on the falling leaves stencil! The black, red and white make a beautiful background. Great contrast for your snowflakes. Thanks for sharing this wonderful card. WOW, such a stunning card! Fabulous card! I love the bright red with that mix of snowflakes! Love your background and that cool snowflake! Love, love this card! So bright and the snowflakes are perfect! Lovely card! I love how you did the snowflake! So bold and graphic! LOVE this! I never would have thought about tracing stencil with black marker and coloring in details. Stunning! Great idea, thank you for sharing your inspiration! Really nice card, beautiful colour combination! So striking! Would never think of using red with the stencil! Thanks for the inspiration! I love your unique take on this stencil. It really has a different feel than the other cards we've seen, which is always exciting to me, because that means there are yet more ways to use a product. And this made for a really lovely winter/holiday card. Thanks for sharing with us! What a lovely vibrant card! I love how the white pops against the red background. Not quite traditional holiday colors and yet it immediately says holiday card to me. Thanks for sharing! Your card is very dynamic. Very nice! Gorgeous backgrounds, so stunning. Wow ! Your card is gorgeous! I love the bright red and the style is beautiful. The bold background is fab with the minimal focal image. Thanks for sharing your creativity. Your card is gorgeous, the coloring on the background is stunning! I never thought about tracing a stencil then coloring it in like that, thank you for the inspiration.